The temperature looks set to stay in an agreeable zone for the near future, and there is no better time to chill poolside, in a park, under a tree or on a terrasse with a good book. Here are two that will do the trick. Seven Fallen Feathers: Racism, Death , and Hard Truths in a Northern City (Anansi Press, $22.95). Anishinaabe journalist and author Tanya Talaga’s account of the seven young people who died in Thunder Bay, Ontario won the Shaughnessy Cohen Prize for Political Writing last week, and it’s hard to come up with a more deserving winning. The book is powerful, well-written, heart-breaking, informative, balanced and brilliant. That sentence could have gone on for much longer, as reading it was a rewarding though emotional experience. Talaga breathes life into every one of the young people who died in the city, while sketching a vivid and troubling portrait of Thunder Bay, its colonial past and the parasitic racism that runs through the city. Talaga connects modern disconnect of Native youth to residential schools to colonial era policies to the giant Nanbijou, all while keeping readers tied to each child’s family story, and the moments leading up to when the tragic event that you as a reader are praying doesn’t happen, but know will. The book is a feat of non-fiction and has been showered in praise and awards across the country. The author puts the systematic breakdown into such clear terms that it is impossible not to understand the plight Onkwehón:we people in Northern Ontario are in at times. “And yet still the inequities rage,” Talaga writes. “Northern First Nations families are faced with the horrific choice of either sending their children to high school in a community that cannot guarantee their safety, or keeping them at home and hoping distance education will be enough. The subject matter is not always easy, but the book is a bonafide five-star account and credit to amazing writing. The Blue Metropolis Literary Festival gave Lee Maracle this year’s First Peoples Literary Prize at the McCord Museum in Montreal April 29, and the author, activist, teacher and orator from the Tsleil-Waututh nation in BC is well worthy of the prize. This reviewer went back to her 2015 collection of poems recently, and was struck by its relevance, poignancy and power. The poem “Oka” is an example. The poems in her collection extend beyond the shores of Turtle Island as far as Palestine, and returns as close as the room next door or the car in the driveway. Her poems are brutally honest at moments, powerfully political at others, and beautifully simple at other times. It’s a great collection to take one poem at a time, or to read in one sitting. 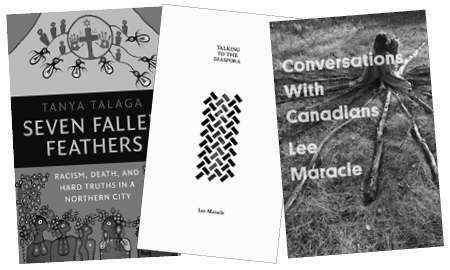 Maracle’s My Conversations With Canadians (Book Thug, $12.99-$23) came out in September last year, perfectly timed to coincide with the Canada 150 celebrations that swept the country. Take a break from Netflix and read a book or two. No one has ever regretted exercising their mind.